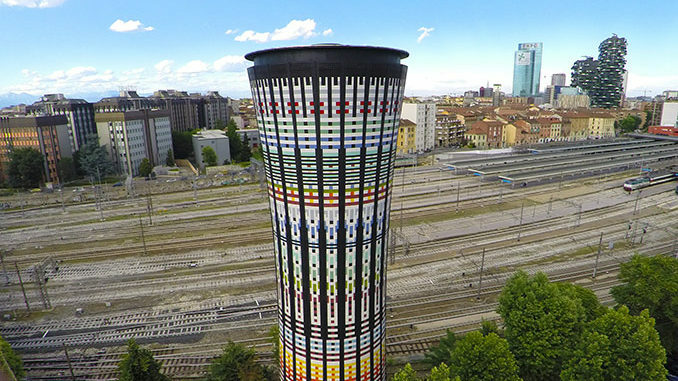 The Torre Arcobaleno, a recognizable mark on the city and emotional landscape of Milan, and symbol of the capital of fashion and design, has been restored to its original splendour thanks to the restoration work carried out by Bazzea-B Construction Technology, Condor, Row Solutions, Mapei and Marazzi, with the patronage of the public works and site amenities Department of the Milan City Council and the hospitality of the State Railways. 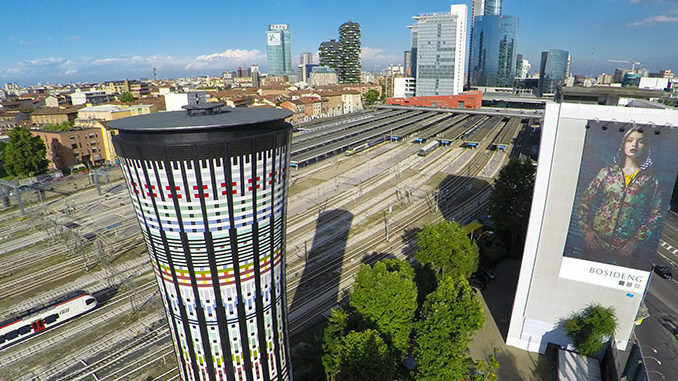 Behind the project is the Architecture Division of the Milan firm Original Designers 6R5 Network, and in particular the professionals Francesco Roggero, Albino Pozzi, Rita Alfano Roggero and Kiyoto Ishimoto. 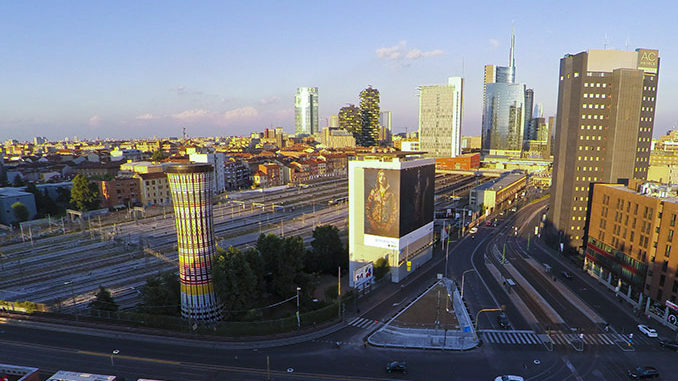 Work costs were fully borne by the companies and architects involved in the project, ac-cording to the basic intent of the operation: a tribute to Milan and to the visitors who come to the city for Expo 2015. 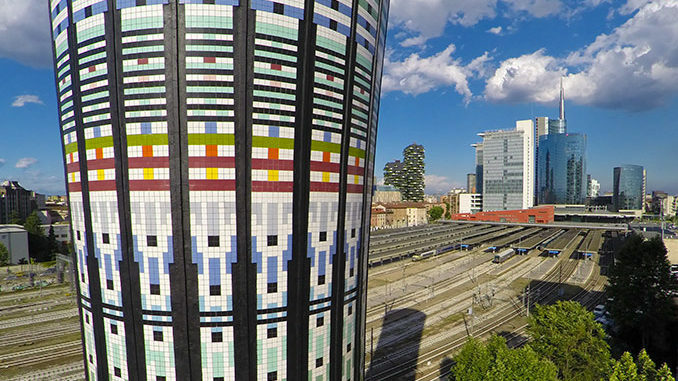 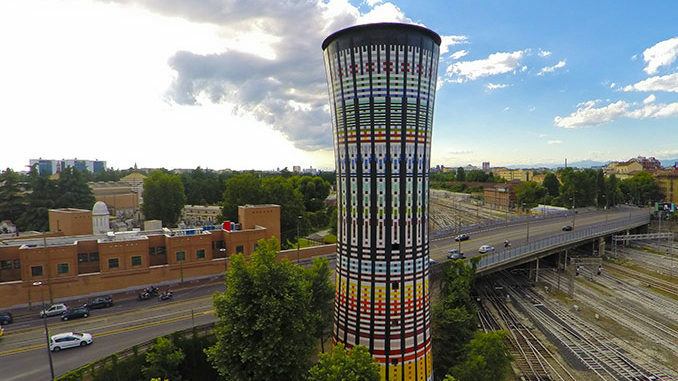 The Tower was created twenty-five years ago, to mark the Soccer World Cup hosted by Italy in 1990, when the same firm, Original Designers 6R5 Network and the companies Mapei, Marazzi and Tadini refurbished the anonymous water tower located within the area of the large Milano Porta Garibaldi railway yard, donating to the city a brightly coloured symbol of Milanese creativity. 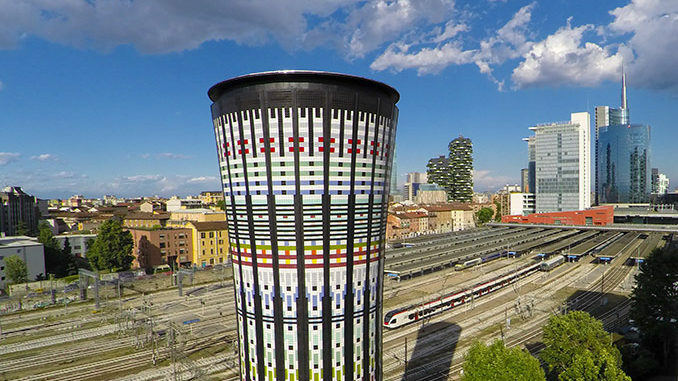 For the Garibaldi area, today redesigned around Piazza Gae Aulenti, the Torre Arcobaleno is a “Colourful Ceramic Totem”, recalling the Master Italian Ceramists and the artisan origins of an industry recognized around the world as a feather in the cap of Made in Italy.